Doing basic things in an extravagant manner? Sounds like teppanyaki to me. I'd defer to Phoebe too. Perhaps I should share one of my own recipes. 1. Brown the meat with half the diced onions, all the garlic, the chili seasoning, soy sauce, mustard, and mesquite. Stir constantly for a nice, even mixture. 2. Set the meat in two containers, drain off the excess fat. If you used the pot to brown the meat, wipe the excess grease out with a paper towel. 3. Place half the meat in the bottom of the pot. Then the onions, then rice. Add the salt. 4. Add 3 cups water, and then layer the rest of the meat over the rice. Top with 1/2 to 2/3 of the diced cabbage. Pour two more cups of water over the cabbage. 5. Bring to a low boil, and cover it for an hour, or until the cabbage is fully cooked and soft. Add cream of mushroom and cheese and stir until fully mixed. Remove from heat and serve. I like to make this in a pressure cooker, where it can cook a little faster, and I only need four cups of water. The layering may sound pointless, but it helps improve the flavor. What do you mean by 1 tsp of mesquite? Where I live that's a kind of wood. Mesquite is a common name for several plants in the genus Prosopis, which contains over 40 species of small leguminous trees. They are native to the southwestern United States and Mexico. If you take the pod of a Mesquite, then grind it, you can make a flour, which can be used for breads. So, in this case, 1tsp of Mesquite flour. Uh, you sure it isn't 1 Tsp of mesquite barbeque sauce for flavouring? 1tsp of any kind of flour in that dish wouldn't do much, unless mesquite flour has flavour as well? Sorry. I'm just so used to calling it mesquite. It's mesquite grill seasoning. Great stuff. 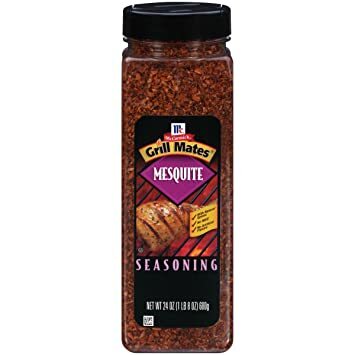 Mesquite grill seasoning. This stuff. You'd be amazed how good it is. Recipe has been edited to make the point clearer, and correct a measuring typo. That sounds pretty interesting. A total of 5 cups of rice, is it? A total of 2-3 cups of rice. You want rice*2+1 cups water. And here I was expecting a Pappy Wrap. Hmm. I wonder. If Mellorine is made up of ice cream from fats that aren't dairy based... can I find...? Here we go. Can I make this from bacon fat? Help, I have food poisoning. I am one of two primary GMs for FATE (both Core and Accelerated) for our group of friends, and I find myself deferring to other all the time for Skill/Approach application calls.